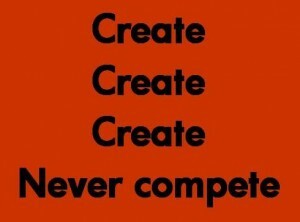 Whether to create or whether to compete, is a good point that ought to be given more thought. We compete when we believe in limits or scarcity. We compete when we think that there is a lack of abundance, when in fact nothing could be further from the truth. In business this means to have exactly the same approach as the competition does, in terms of buying, selling, positioning your business; in fact in business to complete is so often to mirror the competition in every way. The result is that you and your competitor will be chasing the same markets and customers, in exactly the same way, leading to every decreasing margins. An individual competes by following and joining fully, the rat race. Blindly following the crowd because everyone else does so, to follow the crowd is folly; again it means to compete for what the crowd believes to be in limited supply. An individual is actually in the best position to create a life of abundance for themselves, yet they hold back on so much of their creativity because of the beliefs of the crowd and most of these beliefs are incorrect. The difference between to create or to compete in terms of results is massive. In business to create means to find new methods of buying, selling, finding new products to sell and often in new ways that the competition will not try. Thinking outside of the box, giving no thought to lack or limits, to reinvent the wheel when that is what is needed and never to say that it cannot be done. If an individual is to be creative, then to relax is the first requirement. Practice clear thinking when relaxed, for example think on one topic (and not with a competitive mindset) and practice staying on that topic, no matter how much the mind will try to wonder off in some other direction. With practice new original creative ideas will come to you. 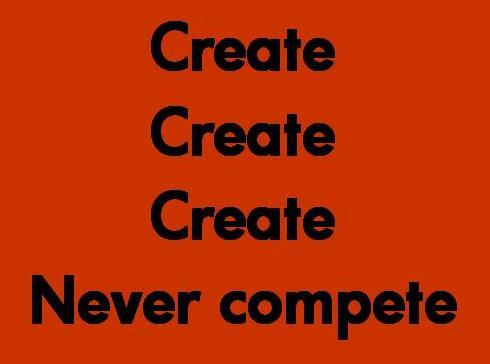 Are you competing or creating? When you understand the important difference between competing and creating, you will be at an advantage others will lack.